Adelaide Casino- $1. Token. Gold color. front & back. Adelaide Casino- $1 White Gold hot stamp. Blue cardsuits. Jupiters Casino-$1 White. 2 maroon, gray insets. Gold hot stamp. Crown Casino-$1 White. 8 gray insets. Crown Casino-$5 Red. 4 dark yellow insets. Launceston- $2 Green. 4 mustard insets. Gold hot stamp. Large key. Launceston- $5 Gray. 5 blue insets. Gold hot stamp. Large key. 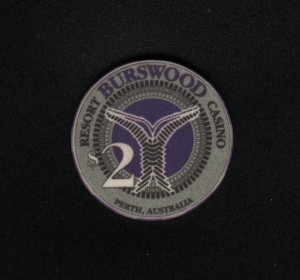 Burswood- $2 Gray. White $2. Chipco. Burswood- $5 Red. 6 white insets. Metal center.